Here are the toddler activities that my daughter and I enjoy almost every day. I’ve scoured so many lists hoping to expand our reach and we’ve added a few good things from others, but mostly we continue to explore on our own. I’m not crafty (or interested in becoming so) so I will not be including any how-to instructions on DIY trains, bubbles, sensory boxes or bags, etc. Our house isn’t set up for mountain climbing furniture (leather couch cushions on hardwood floors are a recipe for disaster instead of adventure unfortunately). And Julia is too young to sit down and finger paint for very long. Also while I consider myself a pretty good mom, I don’t trust us to have something out like shaving cream for finger painting that I’d have to monitor. Julia is astoundingly talented at putting things in her mouth faster than I can get to her, and she thinks it’s hilarious to do so in anticipation of my slow-panic reaction. So, this list is purely of activities that we came upon accidentally or than you can order. Julia’s favorite thing to do is play with the spices. 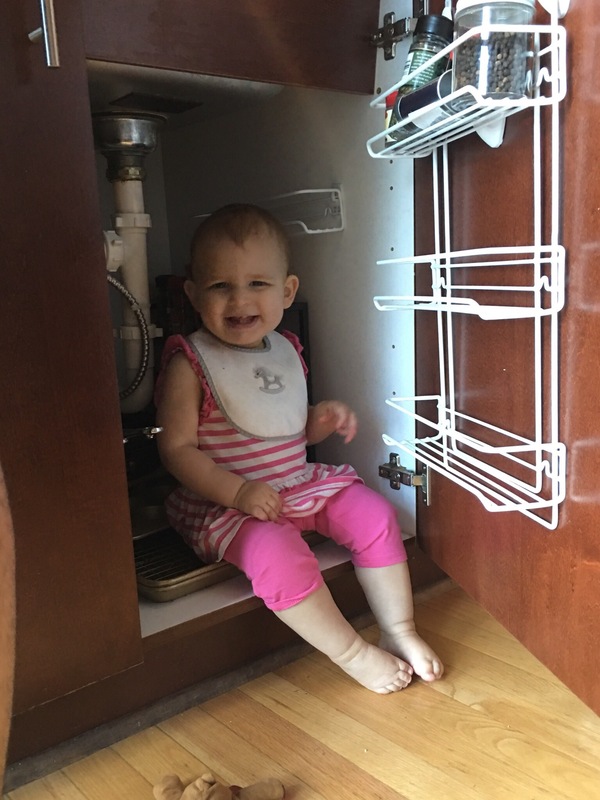 We’ve put them under the sink with a few pots and pans in an effort to baby safe the area and inadvertently created her dream play space. A few command hooks hold the spice rack, and Julia can spend 20 minutes moving each item to the other side’s pots. My husband often puts them back on the rack at night in prep for the next day. We moved the extracts (did you know they have alcohol in them? I didn’t until a recent google), the red dye (which obviously we shouldn’t have – whoops), and chili pepper. Basically anything that would be very bad if she spilt/tasted it. We probably have the most well seasoned kitchen cabinet ever with oregano, etc., all over and it’s completely worth it for how much fun she has. To introduce Julia to Easter I bought a fancy mega basket with pearl-covered insert and filled it with bunny books. For photoshoots near egg hunts (she was under 1 year still), I bought the soft-sided bunny basket from PBK and filled it with easter eggs. Inside each easter egg was a Hape Qube animal. 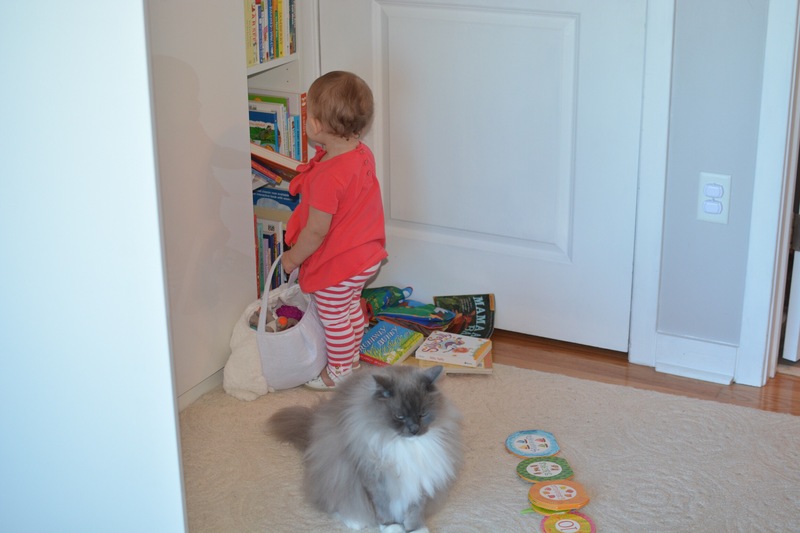 Before I could put the soft basket in storage, Julia confiscated it and for months and months carried it around. She occasionally brings me an egg to open and eagerly waits to see which animal is inside. At 16 months she started opening them herself, and she carries the basket around on her shoulder. Toddlers want to be involved in everything, so if there’s something to build, take apart, or do both, grab it and go. A friend gave Julia the Little Tikes Trike, and it took my husband a Saturday morning to put it together. Julia kept carting off the pieces, examining what he was doing so closely that he couldn’t do it, and happily pointing to the child on the box. She had a blast being a part of the construction. Now we always save projects for her, instead of waiting to do them when she goes to sleep. She really likes the Trike and rides it even though she hates strollers. Maybe it’s because she had a hand in building it. Everyone reads to their kids, and in addition to that obvious use for books, Julia loves to go over to her bookcase and carefully pick out the ones she wants to read, and also to sometimes pull them out with abandon. The easiest way to get her interested in pulling books off the shelf is for me to put them on the shelf. It’s entertaining, never ending, and can sometimes result in added reading. Win win win. I read a blog post that said to create baskets for your children full of small items sorted by color, which is fantastic. I was caught up in it until I realized the expense with ordering the colored baskets, and all the little items to go in each. And I”m pretty sure it would end up like her many sets of blocks where I spend more time sorting them than she does playing with them. So. I started organizing cabinets around the house with her that didn’t need to be organized. We cleaned out the baking pantry (bonus: it did benefit from attention) and Julia got to study sugar and flour boxes, sprinkles, bags of chocolate chips and more. She hugged the Nutella jar and made her father proud (this was random – we do not feed our baby Nutella). We went through all my purses and removed all choking hazards, and practiced putting cards in, or small bags in bigger ones. These things take up a ton of time, are productive for the household, and I think beneficial to the toddler who gets to examine new products, see how clasps open and close, etc. We did this for all the drawers, cabinets, baskets in our entire small home. And now that it’s been a few weeks, we might just do it all over again on the next rainy afternoon. 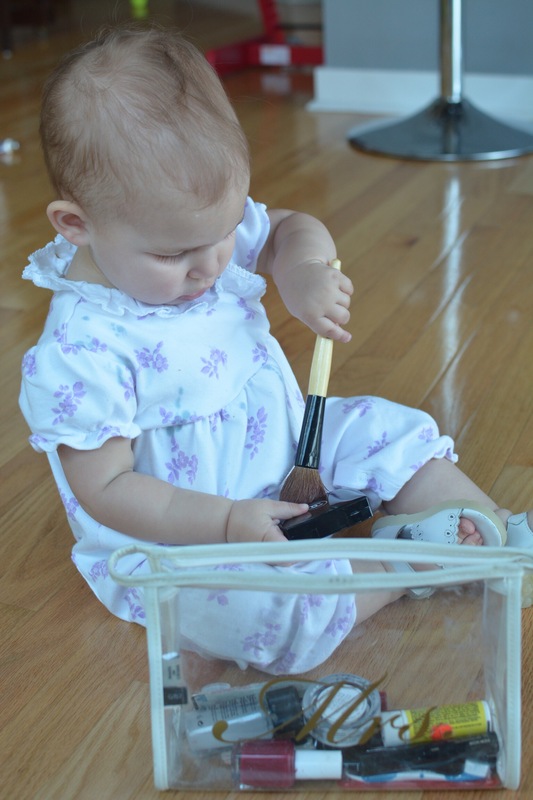 My 16-month old loves to play with my make up. I keep her close by and an eye on her at all times, and we go through it together each morning before leaving the house. It’s another great opportunity for her to take things out of a bag and put them back in. Because of the game’s popularity with her, I’m permanently using my clear travel bag so I can see if anything has gone MIA, and this way I can keep less-safe items like nail clippers on the shelf. Again, productive and a fun way to spend a few minutes together chatting and organizing. I think one of the draws to the bag for her is that she is only given a few minutes a day with it, so she really focuses when it’s out, and I get to feel a little more like me with moisturizer and mascara. I got this idea from those tidy snack pictures on Pinterest where kids choose between fruits and veggies in the muffin pan. Adorable! While Julia eats mostly fruits and veggies, I started small with Cheerios and they did not disappoint. She loved pulling them out of the bag and choosing where to put them. The bag was getting stale, so it was a great way to enjoy them before tossing. And I was surprised how many she ate while playing. If you aren’t into encouraging kids to play with food then maybe this isn’t for you. But I figure it’s all about learning textures, velocity and organization. She got much more than $4 worth of entertainment out of this long activity. Instead of plastic fruits, I had the brilliant idea to buy a bunch of singles from the veggie/fruit section at the grocery store. I felt really good about teaching Julia real foods until she made tomato sauce in the bowl, and the pepper quickly went bad and developed a nasty hole. Pros and cons I guess. Anyway it was fun and we got great pictures. I’d recommend this to a friend, and we will do it all summer for sure. I like to say “watch out for spiders in the veggie patch” and tickle her. She giggles and giggles.